Two dozen beautifuly arranged Red Roses with Baby's Breath and greens! Show that special someone just how special they truly are. An exquisite choice to express your sentiments to that special someone. This arrangement is the perfect gift for any season or occasion! A traditional presentation, this dozen medium stem pink roses is the perfect gift to send any time of the year. They arrive arranged in their own vase. 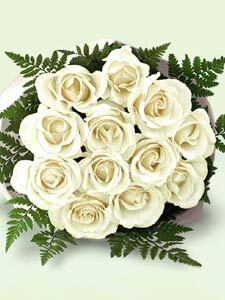 Aim high - express your best wishes with this beautiful bouquet of one dozen roses in a glass vase. Vase may differ than the one shown in the photo. Celebrate the spirit of freedom with six beautiful red roses, nestled in a puff of white gypsophila, and topped off with an American flag. The perfect way to pay lasting tribute to a loved one. A traditional presentation, this striking mix of two or more colors of medium stemmed roses is the perfect gift to send any time of the year. Rose colors will vary to fit the season and to ensure the freshest blooms are delivered. What could be more appealing than a simple flower arrangement of six burnt-orange roses nestled in a bed of bear grass? It’s an attractive addition to any décor… and the perfect gift for a man or woman. They will be charmed by this gift of a dozen pink roses in a glass vase, surrounded by assorted greenery. With a dozen lavender roses rising from a bed of exotic orchids, Heavenly Grace flowers is a graceful tribute and a touching gesture of remembrance. The decorative urn adds a special touch of elegance. The container may vary from the photo shown. These balloons will be assorted Valentine's Day Balloons....and they make a perfect accent to any of our Valentine's Day arrangements. We have selected 18 bright and colorful diminutive roses to form a celebration of color. Our sweet roses make a cheery display in their perfect yet petite version of a standard rose. Your long lasting roses will arrive wrapped. Looking for something different than the usual? A floral gift that will display your imagination in full bloom? This towering topiary of lilies, orchids and roses is artistically arranged with tropical greenery and is a unique and creative gift that will make you stand out from the crowd. Six Red Roses arranged with Baby's Breath and greens. An elegant flower arrangement that takes the concept of a dozen roses to a whole new level! A forest of long-stemmed red roses rises up from the base with rose blooms. A ring of fiery red roses surrounds a cloud of fluffy hydrangea blossoms in this striking bouquet, resting on a bed of black river rocks. It’s a modern and sophisticated floral arrangement that’s sure to make an impression! Purple passion blooms with these elegant lavender roses. These freshly cut medium stem roses arrive wrapped with greens and ready for the recipient to arrange in their own special way. You can choose to have them arranged in a vase by selecting that option below.